French Ministry of Defence announces the purchase of 12 Airbus tankers with engines by Rolls-Royce UK. 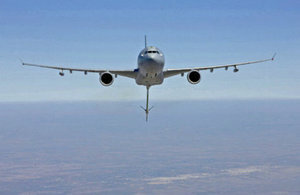 On 20 November French Defence Minister Jean-Yves Le Drian announced the acquisition of 12 Rolls-Royce Trent 700-powered Airbus A330 Multi Role Tanker Transport Aircraft (MRTT). The A330/Trent 700 configuration is in service with the Royal Air Force (RAF). The decision will benefit both UK and French economies, and offers the opportunity for commonality between RAF and French Air Force tanker fleets, including training and support. The French acquisition followed two years of sustained support to the company’s campaign from UK Trade and Investment Defence and Security Organisation (UKTI DSO), UKTI Paris, British Consul, Bordeaux, and British Embassy, Paris. The deal is worth a total of €3 billion (£2.38 billion), of which £320 million is revenue to Rolls Royce UK. The contract with the Direction Générale de l’Armement (DGA/French Ministry of Defence), enshrined in France’s 2013 strategic defence review (Livre Blanc) and ensuing Military Programming Law, is a success for European cooperation. Aircraft assembly by Airbus at Toulouse, avionics design and integraton by Thales, and Trent 700 engines by Rolls-Royce UK. First delivery is planned for 2018. To find out how UKTI DSO can help you export see the defence and security exporting guide.